Aegina, Aigina, Saronic Islands, Tourism & Travel Guide of Greece. Aegina (6,300 inhabits.) is a favorite among holidaymakers for its excellent beaches, clear seas and fine climate. The terrain is flat and cycling is popular. Other means of transport are buses, taxis and horsedrawn carriages. 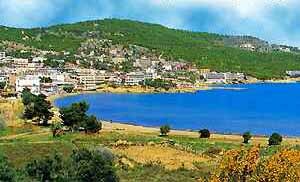 There are beauty spots and beaches at Plakakia, Agia Marina, Faros and Marathonas. Agistri and Moni are two small wooded islands which offer opportunities for excursions. 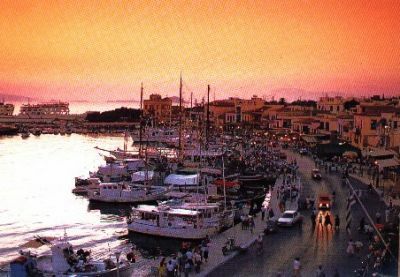 Aegina is the main port on the island that dominates the Saronic Gulf and it's only an hour's ride from Piraeus. In Classical times Aegina was called "the eyesore of gulf" since it is very visible from the Akropolis and was an arch rival for some time with Athens. At the island, the lone remaining column from the archaic Temple of Apollo is a distinguishing landmark. The site is now called Kolona, due to the remaining column. It is a picturesque town centered on the harbor where fresh fruit and seafood is brought in daily. Yoy can see the Temple of Apollo site and to talk into a brief view of the closed Archaeological Museum, which had some big renovations going on due to structural damage. If you can get a postcard of the harbor at Aegina, you can still see the ancient docks under the water. Also, all the island's transportation is centered in Aegina so you'll have to go through there often if your moving about the island. On the way to the main temple, we pass by an unbelievably large church. It is brand new and is supposedly the largest "church" in all of Europe. It sounds too odd to be true, but it is at the site of the monastery containing the body of Saint Nektarios (the first saint to be canonized by the Orthodox church in modern times). If your on the island, stop by and take a few photos. Agia Marina: A small port town that relies mainly on tourism for the temple on the hill above. The restaurants are great. Surely go by the "Three Brothers (Adelphoi)" by the shore and inland a kilometer (along well lit roads) is supposedly the best on the island. The Temple of Aphaia at the Archaeological site of Aphaia on Aegina is the big draw. It is fairly intact and most of the pediment statues have been spirited off to Germany. There were some terrific statues though. It still is unique in that the interior second level of columns have been reerected at some places. It has been struck by lightning in the past 30 years so there is a big, tacky rod next to the temple. Though the placement of the temple on a hilltop has the drawback of lightening strikes, you can see the Parthenon and the temple at Sounion from here if you bring some good binoculars. There is also a good view back to the mainland and some neat water trapping devices (a valuable commodity in the summer). Perdhika: A really small town on the Southern tip of the island. Some good little bay restaurants and boats leave here for the island of Moni across the strait. History: Literally at the center of the Saronic Gulf, between Athens, Corinth and Epidaurus, the small island of Aegina possesses one of the most unique natural locations in Greece. It has been inhabited since the Neolithic era, and a lot of material concerning the life and civilization of these first inhabitants are preserved until today. During the so-called Greek Middle Age the island remained deserted, but around 850 BC it was inhabited by Doric races coming from Epidaurus. In the seventh century BC, Aegina was already one of the largest naval powers and we know that she was the first among the Greek cities that developed minting. As it was allied with Sparta and the other Peloponnesian cities, she has been for many years a great opponent of Athens at the naval field until two defeats and a capture of the city in 457 BC reduced her to a vassal to Athens. During the period of its grandeur, the island, already reputed for its workshops of bronze, brass and pottery, was embellished with several Sanctuaries. The most famous is the sanctuary of Aphaea, a local goddess, related to the Cretan goddess Britomartis, who was later matched with Athena, On an imposing artificial balcony overlooking the entire Saronic Gulf, 12 miles away from the city, rose from the archaic period a sacred yard with a temple. Around 510 BC that temple was destroyed and was replaced by a new large Doric temple, one of the masterpieces of Greek Archaic architecture, it is a peripteral temple with six Doric pillars on each facade and twelve on each long side, made of local poros stone covered with marble plaster decorated with painted illustrations. At the interior, the porch and the opisthodrome had two pillars whereas the cella was divided into three naves with a double row of five pillars; above them, there was a second row of smaller pillars which supported the roof. The original multi-colority is lost. However, a large part of the pillars and parts of the architraves, the metopes and the walls of the cella were restored between 1956 and 1960. The holes between the pillars reveal the previous existence of railings.